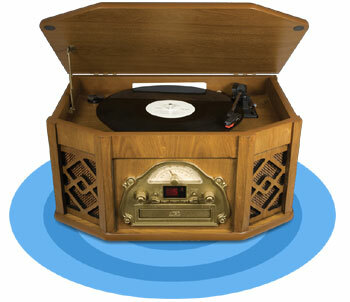 Play and preserve your classic vinyl and cassette songs digitally with Tunewriter Phonographs. Choose from classically designed to modern designed turntables to fit your decor. Enjoy all of your music in elegant style. Remember when stereo systems and console radios and TVs were all-in-one solutions that provided years of enjoyment? So do we. 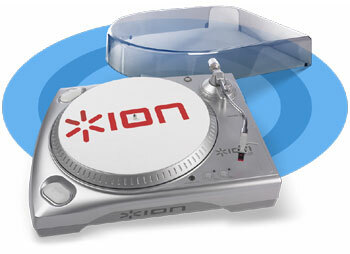 Now ION returns you to those glory days and helps you enjoy all of your music with OMNI PLAY. This elegant looking music system plays your LPs, CDs, tapes and even contains an AM/FM radio. It even plays 78 RPM records! Forget about the hassles of stacking and connecting black steel boxes with messy cables, with OMNI PLAY, everything you need is housed in one single place, just like record players and stereo systems of yesteryear. Finally you can enjoy your entire music collection, no matter what year it came out, all in one convenient place. OMNI PLAY is self-contained within an elegant, genuine wood-grain exterior that is sure to save you space while looking great in your home. Housed within OMNI PLAY’s luxurious exterior are built-in stereo speakers that provide full, rich sound. Specially angled speaker design ensures room-filling, crystal-clear audio no matter where you put OMNI PLAY in your home. Not every record, tape CD or broadcast sounds the same as another but with OMNI PLAY you can custom tailor your musical experience with equalization controls to adjust bass and treble. A traditional-style knob with an easy-to-read needle help make finding your favorite radio station a snap. A bright red LED display provides an instant visual indication of the CD track you are playing. You can even see the track number clearly form across the room. OMNI PLAY is the perfect solution if you are looking to enjoy great sounding audio from vinyl records, cassette tapes, CDs or radio, in a package that is both convenient and stylish. TTUSB DC is a high-quality turntable with a removable dust cover and a special feature: USB output. It enables anyone to transfer music from records to computer. On your computer, you can listen to your music, record it to CD, or transfer it to your iPod or MP3 player and take it with you. TTUSB DC connects with ease to your home stereo with a switchable-level output. You can connect TTUSB DC to your stereo even if you don't have a phono input – no preamp required! A durable dustcover is included with TTUSB DC to protect your needle and keep your slipmat clean and even fits while a record up to 12 inches is playing. ION's exclusive software suite gives you a powerful set of tools that make transferring your music easy. EZ Vinyl Converter is the best way to record and convert vinyl directly to your iTunes music library. TTUSB DC also has a line input jack so you can connect other music sources such as cassette decks, and turn your other music into MP3s. TTUSB DC just might be the perfect turntable. It plays all of your records, enables you to listen to your music collection wherever you are, and keeps your precious vinyl safe while it's playing. Plug and Play USB connection: no drivers needed!